The Organization Man, the famous book by Fortune editor William H. Whyte written in 1955 about corporate careers, defined for a generation the career experience of managers entering the business world, as well as the effects of that experience on society. It provided the details for practical issues such as how corporations made hiring decisions (even detailing how to “cheat” on personality tests), how executives thought and acted, and how they got ahead in their careers. In those days, virtually all the good jobs in business were in large corporations. When The Organization Man was published, and for the generation that followed, business careers began with college recruiting, when employers looked for candidates who could be molded into executives with the values and characteristics appropriate for their company. They looked for potential, and the key component of potential was their personality. Once hired, the company set about training and developing the skills of the young manager – not just their business skills but their social and interpersonal skills. Pressures to conform were considerable, and those pressures extended to their family and to their life outside work. Managers were groomed to see their interests and identity as defined by their organization, hence “the Organization Man.” The defining attribute of careers was that they were governed by the company’s rules and interests. All senior positions were filled by promotions from within, which made it essentially impossible to quit because no other company would hire managers from the outside. The company decided who would advance, often based on elaborate assessment exercises, when they would move, and where they would go. The hierarchy of authority and the rewards associated with it were clear, as was the path through which one got there. Candidates climbed well-defined ladders of advancement, and no deviations were allowed. This included relocations, which were frequent, and the failure to accept them was a “career-ending move.” The skills crucial to getting ahead involved good performance but also managing internal politics – especially fitting in and cultivating superiors. The companies also took care of their managers however. No one was laid off and virtually no one was ever fired. Managers who were passed over were shunted to marginal positions and retired with generous pensions. The system Whyte described took root first in these large corporations, but it was copied across all but the very smallest businesses. Many people still believe that the model he outlined is the one to follow, but in fact the Organization Man died a while ago. The fact that this approach continues to be used as a model has less to do with any evidence that it still exists and more to do with the difficulty in coming up with alternative descriptions of how careers are in fact operating. The chapters in this volume suggest some of the different models of how careers look now. Before getting to them, however, it is important to describe the ways in which the old model is coming apart. In the mid-1960s a study of personnel departments found that 96 percent had a dedicated manpower planning function that was charged with forecasting human capital needs and then developing the approaches to meet them (Allen, 1966). Hiring at the entry level was a key part of that process but more important, and more complex, was the process of developing talent and moving candidates through organizational charts to arrive at the right roles at the right time. Virtually every company had an executive called “the manpower planner” who headed that functional area. The most crucial job in the entire human resources (HR) organization, some would argue the most powerful job in the entire company, was the position informally known as “chess master.” That was the person who decided how executives would move around the chessboard represented by the company’s various assignments. The favored few would find themselves with plum jobs in corporate headquarters; those out of favor would see the moving van come to take them to the greenfield plant in East Nowhere. James Walker has described the manpower forecasts of the American Oil subsidiary of Standard Oil Corporation as extending out ten years (Walker, 1970), a figure that may have been typical. Estimates of demand for talent in the future were then matched against estimates of supply. The assumption in these models was that the supply of talent was within the control of the company, an internal function (see, for example, Rowland and Sovereign, 1969). Because the supply for all but entry-level jobs came only from within, managing that supply involved adjusting the rate at which candidates progressed from one job to the other in the firm. The first serious model for understanding the movement of employees within organizations was based on the work of the mathematician Andrei Markov, who developed procedures for understanding the movement of items from one state to another, in this case the movement of individuals from one job in a promotion hierarchy to another. The practical use of Markov chain analysis was in forecasting the number of people who would be in different positions in the hierarchy at some future point. It began by calculating historical averages of the percentage of individuals who moved from one position in the organization to another each year. By applying those percentages to the employment levels in each job, it was possible to estimate how those levels would be different in future years. More sophisticated models attempted to calculate the rates of movement from one position to another by seeing how they varied with factors such as company growth rates and the attributes of the individuals in each position, such as average tenure (see Walker, 1970, for examples). As models began to accommodate the variety of arrangements possible for advancement in an organization (e.g. “flexible” hierarchies, whereby one could move across functional silos), their complexity – and the amount of mathematics required to describe them – expanded considerably (see, for example, Dill, Gaver, and Weber, 1966). Armed with these estimates of what the supply of talent would be for particular jobs, the planners altered promotion paths and rates of development to help get the right number of people to the right positions at the right point in time. A 1966 report by McKinsey and Company suggests how companies were tackling the problem of talent management even for the more straightforward functional areas, in this case sales. At least initially, the job structure for sales positions was reasonably flat: salesmen and their managers. The complication was getting individuals with the right abilities into the appropriate sales jobs and, particularly, to fill the management jobs. As with other jobs, the new model began with an “audit,” essentially a replacement table, that looked at the performance and attributes of incumbents and forecasts of how many individuals would be in which position in the future. This was compared to an estimate of demand, which included assessments of the characteristics of salesmen that the companies needed for each position. In the process, the companies were able to forecast where shortfalls would occur. The McKinsey report details the problems that companies were having with sales, and they sound incredibly contemporary. First, shortfalls in talent were happening in large measure because of turnover. Promising salesmen were leaving at an especially high rate before their first promotion. Second, there was real concern about the large number of mediocre performers who stayed in place and clogged the middle stages of the career. What was not contemporary was the solution. The companies developed a new model for careers (seen in figure 1.1), a career path that began with “up or out” promotions to weed out poor performers within eighteen months and continued with forced career decisions every two or three years. Several aspects of this new career path are extraordinary. What had been a straightforward sales job became a complex hierarchy with ten distinct positions, all organized along a promotion path. Candidates were either promoted or reassigned every few years, and every job had a tenure requirement associated with it. It was impossible to remain in those jobs longer without being moved in one direction or another. The candidates apparently had little choice in the matter. It was also clear that the implicit priority in this model was to develop managerial expertise. Individuals ended up in sales careers by default, when they were not promoted up the management hierarchy. Those who stayed in customer sales were not left alone, however. They faced a separate, five-step career hierarchy with a series of up or out promotion decisions. The report also quotes a vice-president of sales about the priority placed on development, saying that, for every promotion in their company, the president wanted to know the names of the individuals who that candidate has developed. “And if he can’t cite examples of men he has helped bring along, the chances of him getting promoted in this organization are pretty slim” (Pearson, 1966, p. 46). Remember, this is for sales jobs, a function we now think of as being individual-oriented and brutally competitive among the individuals involved. The arrangement above, which played out in different ways across a range of jobs and companies, transformed what had been a haphazard employment system into one that was highly regimented and bureaucratic. Workforce planning, succession planning, and the Organization Man approach to careers began to fall apart when the ability to forecast the overall level of demand in the economy collapsed following the oil price shocks, first in 1973 and then in 1979. The economy grew far more slowly than anticipated. Gross national product (GNP), which had been growing at a rate of about 5 to 6 percent in real terms during most of the 1960s, actually declined in 1974, 1975, and again in 1980. The 1970s became known as the decade of “stagflation” – low economic growth despite inflation. Companies that had planned on growth of 6 percent per year on average suddenly discovered that their business demand not only failed to meet that target but actually declined. Talent management arrangements ran into trouble because of the long lead time inherent in a system of internal development. The number of managers who were ready for director positions, for example, was set in motion by decisions made ten years or more earlier and based on forecasts of much higher demand. Overshooting demand even by only a few percentage points soon begins to add up; 3 percent per year over a decade such as the 1970s would lead to having one-third too many managers in the pipeline at the end of the decade. What to do with all those excess managerial candidates, especially in the context of lifetime employment for white-collar workers, which virtually all companies practiced? Commenting on the decline in corporate growth and the slowdown in opportunities that resulted, Sandra Beldt and Donald Kewell noted at the time that companies had been backed into a corner, as promotions were the most significant reward and the source of motivation. In response, they found that “the need to continue promoting people has been met in many companies by creating positions; often such positions have a title without commensurate responsibility and authority” (Beldt and Kewell, 1980). In other words, they added management and executive jobs, and the bureaucracies of the corporations began to bloat. Facing the internal glut of talent, the sharp recession of 1981, and the changes in the economic environment noted above, employers moved aggressively to break the lifetime employment arrangements with their employees. As late as the end of the 1970s survey evidence from the Conference Board indicated that management’s priorities in setting employment practices were to build a loyal, stable workforce. A decade later, however, by the end of the 1980s, that priority had clearly shifted to increasing organizational performance and reducing costs (these surveys are discussed in Belous, 1989). The most powerful evidence in this regard is another Conference Board survey, which found more than two-thirds of the large employers in the sample reporting that they changed their practice and no longer offered employment security; only 3 percent in the mid-1990s said that they still offered job security to employees (Conference Board, 1997). The most important manifestation of this new relationship was downsizing. The term “downsizing” was at first a euphemism for layoffs, but later it came to mean something different. Whereas layoffs had been seen as a temporary response to downturns in business resulting from recessions focused on hourly workers, downsizing was a permanent reduction in jobs, and it did not appear to differentiate between levels in the organization. The US Bureau of Labor Statistics (BLS) did not even measure permanent job losses (as distinct from recession-based and temporary) until after 1984, because of the assumption that workers who had lost their jobs would get them back once business recovered. Similarly, the level of “contingent work,” defined by the BLS as jobs that are expected to end soon, was not measured before the 1990s. Contingent work by this definition remained roughly constant at about 4.3 percent of the employed workforce through the late 1990s, even as the overall unemployment rate fell and the labor market tightened (Hipple, 2001). The American Management Association (AMA) surveyed its member companies about downsizing during the 1990s, finding that the incidence of downsizing had increased virtually every year through 1996, despite the economic expansion of the decade. Roughly a half of the companies reported downsizing, and 40 percent had downsizing in two or more separate years over the previous six (American Management Association, 1996). Other surveys reported roughly similar rates of downsizing. The scale of these job cuts was unprecedented in a period of economic expansion. White-collar and managerial employees experienced the most fundamental change from this new approach, because they were the ones with the most protections to lose. 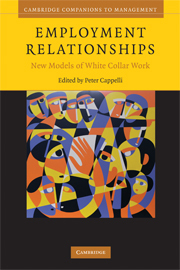 There was a sharp rise in unemployment for white-collar employees relative to other groups beginning in the 1980s, as well as an increased risk of job loss for individuals (for an explicit comparison, see Cappelli, 1992), which is certainly among the strongest evidence that whatever special protection this employee group had had in the past was now gone. White-collar and managerial employees now face much the same insecurity and instability as production workers, a profound change that undermined what had been the very basis of the distinction between white-collar and blue-collar. That distinction stems from the New-Deal-era Fair Labor Standards Act, which was based on the assumption that production workers needed legislative protection that white-collar workers did not because the latter were already protected by the firm. White-collar employees who kept their jobs also saw internal careers evaporating as job ladders shrank, restructuring disrupted the promotion tracks that remained, and external hiring blocked advancement by filling senior positions. In that situation, most employers abandoned virtually everything about the old system, even the rhetoric about their responsibility to employees. The causes of downsizing also changed over time. Job cuts had been associated with recessions in the past, but a growing number of companies toward the end of the 1990s reported that job cuts resulted from internal management decisions – restructuring (66 percent) and outsourcing (23 percent). Virtually none cited overall economic conditions as an explanation, and most of the companies that cut were profitable in the year they were cutting. Further, downsizing was no longer necessarily about shrinking the size of the workforce: 31 percent of those firms in the AMA surveys were actually adding and cutting workers at the same time in 1996, and the average firm that had a downsizing was in fact growing by 6 percent (American Management Association, 1996). This development suggests that firms were relying on the outside labor market to restructure, dropping skills that were no longer needed and bringing in new ones. Data on workers who have been permanently displaced from their jobs since 1981 confirms the fact that job security declined. The overall rate at which workers were permanently displaced backed down somewhat in the late 1980s from the peak of the recession period, 1981–3, but then rose again – despite the economic recovery – and jumped sharply through 1995. The rate at which workers were thrown out of their jobs was about the same in 1993–5, a period of significant economic expansion and prosperity in the economy as a whole, as compared to the 1981–3 recession, the worst downturn since the Great Depression (Farber, 1998). It is difficult to find more compelling evidence that the nature of the employment relationship had changed. About 15 percent of the workforce saw their jobs go for ever during that 1993–5 period of growth. The cause of the job losses reported in these surveys of individual workers mirrors the developments in the firm surveys – shifting away from economy- or company-wide reasons such as downturns in business or plant closures toward eliminating particular positions associated with restructuring. Further, the costs of job loss since the 1980s actually increased, especially for older workers who otherwise found it difficult to locate new jobs, even as the improved economic picture saw it decline for other workers (Farber, 2003). The following chart describes the downsizing experience of the most stable workers, those who had been with their employers for more than twenty years. It compares the experience in the steepest downturn in modern times, the recession of 1981–2, to the period of the most rapid growth in a generation, 1999–2000. It is no surprise to see the displacement rate for blue-collar workers roughly twice as high during the recession as during the boom. What is quite remarkable is that there is almost no difference in the rate of layoff for white-collar workers in the two periods. Reengineering and restructuring generally explains why white-collar job losses remained high even in the period of economic expansion. Source: Monthly Labor Review (2004). Companies began to find new ways to get work done with fewer people after the 1981 recession and to get rid of the management roles that had been created during the 1970s, a process that became known as “reengineering.” Work systems that empower employees, such as cross-functional teams, eliminated supervisory positions and widened spans of control. Information systems eliminate many of the internal control functions of middle management positions, and decentralizing operations through the creation of profit centers and similar arrangements further reduce the need for central administration. Corporate hierarchies flattened in the 1990s (Rajan and Wulf, 2006), and with them job and career ladders, in part as headquarters were deflated and power was decentralized. The net consequence of these developments was to reduce the need for managers just at the time that companies had an excess supply of managerial talent carried over from the 1970s. As a result, the priority inside companies shifted from developing talent to getting rid of talent. New companies that started in this period found a plentiful supply of managerial skills and talent available on the outside market. There was no need to develop talent when it could easily be acquired “ready to go.” Manpower planning was not exactly a challenging exercise when companies were cutting back jobs; nor was it even necessary when companies had the option of bringing in experienced hires from the outside: just wait and see what was needed and then go get it.